25 chapters covering virtually all your carpet and upholstery cleaning technical challenges and concerns. 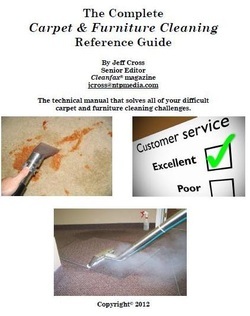 Any carpet cleaning or furniture cleaning technician must own this reference guide. Includes an intensive spot and stain removal guide and a carpet color (bleach spot) repair guide. Do you want to learn how to remove the toughest stains, including red wine, ink, mustard and many more? Do you know why some carpet types are easier to clean than others? Do you ever have issues with delicate upholstery fabrics? Do you avoid upholstery cleaning altogether? Do you know which detergent or other cleaning products you should use, and how they work? Do you ever have spots that come back? Do you ever have challenges with commercial carpet cleaning? Do you want to know which cleaning technique or method is best? Do you want to learn some 'secrets' to removing ground-in soil? Do you want to know how to keep carpet clean longer? If you answered 'yes' to any of these questions, you need this technical guide. 25 chapters and 75 pages of solid technical skill application. Available in either printed or digital format. Please note: The printed format is only available in the United States and Canada. All other orders must be in digital format. The first two "add to cart" options go directly to a PayPal cart. If you wish to use your credit card on this page, use the third form. Printed version, sent express delivery to all U.S. and Canadian addresses. Digital version, delivered to your inbox anywhere in the world.